Adherium has received 510(K) clearance from the US Food and Drug Administration (FDA) for its new inhaler monitoring device for AstraZeneca’s Symbicort aerosol inhaler. SmartTouch for Symbicort is a new device installed onto a patient’s inhaler to monitor and advance medication adherence under self-management plan. The new device has been developed for use in patients suffering from respiratory conditions such as asthma and COPD. The device will record the date and time of the inhaler and automatically transfers the information to an app on the patient’s phone or tablet. SmartTouch can store the history of patient medication usage patterns, helping physicians to also evaluate the information and take evidence-based decisions. SmartTouch can be used in home monitoring programs, including hospital re-admission prevention programs. The device features three buttons, which allow patients to access the audio visual- reminders and battery monitoring. Adherium’s Smartinhaler platform incorporates a Bluetooth enabled sensor and smartphone application to detect and record actual usage of inhaled medications. The company offers different Smartinhaler sensor configurations, which are compatible with multiple medications. Adherium CEO Arik Anderson said: “The SmartTouch for Symbicort is the most advanced Smartinhaler product to date for Adherium and a key product in our strategic collaboration with AstraZeneca by bringing the benefits of digital monitoring to patients and their physicians. 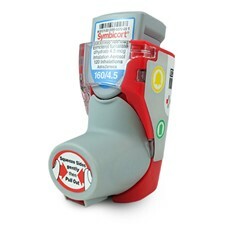 Image: SmartTouch for Symbicort inhaler monitoring device. Photo: courtesy of Adherium.